I bought new tires the other day. 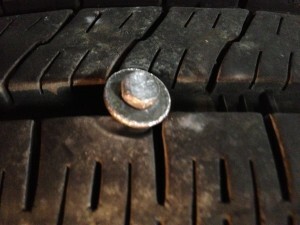 I got one of them patched a few months ago, after attracting a nice bolt into the tread, and the TPMS light flickered alive last week, signaling a slow leak either in that plug, or from something else. And my car, after almost five years and just shy of 50,000 miles, still sports the factory rubber, and although I don’t drive too much anymore, I felt a need to get a fresh set of tires. So I went to this local tire place, a hole-in-the-wall run by this Mexican guy who’s far more honest than the corporate-owned tire hacks that would probably look at me and see their next four boat payments, pushing all sorts of extensive warranties and protective coatings and laser alignments with stories of catastrophic failure and imminent death if I did not comply. Also, the guy working there pronounces the Yaris “Jar-ees” which I find hilarious. While I waited on the new rubber, I read the bulk of the new Joe Meno book, Office Girl. I had mixed feelings about picking up this book, but I was in Alameda a weekend or two ago, and wandered into their local non-chain book store and felt a need to buy something there, and it was either this or drop the money and serious time investment to read 1Q84 in its new three-volume paperback edition. And yes, I should be reading Infinite Jest, but I needed a quick break from that for the time being. I read Meno’s Hairstyles of the Damned years ago, and liked it, although I try to avoid reading that kind of story for the same reason an early-90s Michael Jordan should have avoided watching baseball games: it makes me think I’ve got a book like this in my system that I need to write, which distracts me from my actual mission, which is writing fucked up and absurdist fiction, something much more within my wheelhouse. Hairstyles, the story of a Chicago metalhead brought over to the punk/alternative side by a female best friend who he eventually falls in love with, is the kind of formula I always wanted to apply to a book that took place in an Indiana of the late 80s. In 2009, I spent NaNoWriMo hacking out such a book, the bulk of the time chipping at a manuscript while I was off in Mexico. I passed the 50K mark on that book, although it’s only maybe 25% done. I looked at it recently, and it is fairly horrible and beyond help. I hoped I could get through Meno’s new book without stirring up those feelings again. This book has to do with a girl and a guy who are proto-hipsters at the end of 1999, in Chicago. They drift from office temp gig to office temp gig, and fall in love, but neither one wants to fully acknowledge it, and blah blah blah. The book reads quickly, because it’s broken into incredibly small pieces, each one being a minimal but effective capture of mood or description. It’s almost entirely character description, and it works well. One of the things I liked best about Hairstyles was that ability to trap the perfect qualities of a person or a scene, in a minimal amount of words. (Basically, the opposite of what this rambling excuse of a review is doing.) Office Girl does a fair amount of this, too. My problem with the book was the entire hipster angle. I guess it grated on me because when I was in New York in this timeframe, a similar demographic surrounded me, and I sat just outside of it. I worked at a place in my late 20s where almost everyone around me was in their early 20s. While tech writing and working on internet crap was my career and something I’d been doing for almost a decade, these were all Ivy League trust fund kids who stumbled into the job as project managers and spent all of their free cycles simultaneously living a life of poverty and wealth in the way you can only do in New York. Meno’s book chipped at the edges of that, albeit in another city, but it’s almost like the few bits of plot choice in the book were taken from a hipster magnetic poetry kit purchased at Urban Outfitters. The characters have goofy glasses and share apartments with crappy roommates and consider ironic hobbies. There is no mention of star tattoos or “oh, I don’t have cable” or organic groceries, so I guess he did stick to the ’99 timeline well. I was also distracted during the read, as some guy talked far too loud about his MG convertible. And then at the corner of Market and Grand, some kind of protest started, one of these “let’s end violence by shouting violently at traffic” things I did not fully understand. Shortly after I finished the book, I got my keys back to the Jar-ees and took off, my wallet $320 lighter, but once again feeling a solid 11/32″ of tread. Awesome.